It is reported in the local daily that City Council has finally issued a 30 day default notice to Millennium Corp. for their failure to produce anything tangible to prove they would complete this hotel project. It is reported that Millennium still has 30 days to come up with a suitable plan and demonstrate good faith they would actually complete this project. Jerry Berry the City manager said that even if Millennium sold the land to another developer there is a covenant on the land restricting use to a hotel. If Millennium walks away from the deal, the City would also seek to recover $3 million it has already invested in this project. Mayor Ruttan said the City would still prefer to have Millennium complete this project. Editor's Comment: I will be interested to find out what exactly the City got for the $3 million it is said it has already invested in this project. 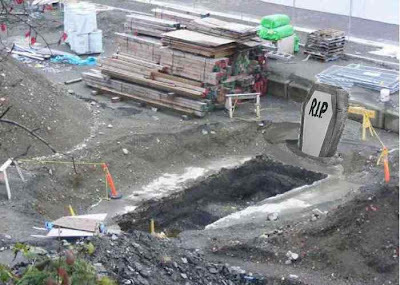 I hope they have not actually paid Millennium $3 million for the oversized grave site currently occupying the property. Plans for Hotel or Condominium?